Pre-heat oven to 180°C/ 350°F. Peel and dice onion and garlic and chop parsley finely. Add to a large mixing bowl with ground meat, some of the ground sweet paprika, ground smoked paprika, baking powder, water, and olive oil and combine with hands. Season with salt and pepper. Form ground meat into equal-sized small oval balls. Transfer meatballs to refrigerator for approx. 1 hr. Halve or quarter potatoes. Halve bell peppers, remove seeds, and cut into strips. Peel and quarter onions. Cut zucchini into bite-sized chunks. Distribute vegetables over baking sheet. Drizzle with olive oil and sprinkle with paprika, salt, and pepper. Toss to coat. Transfer to oven and roast at 180°C/350°F for approx. 35 min. Just before vegetable are done roasting, heat oil in a frying pan set over medium-high heat and fry ćevapi for approx. 5 – 7 min., or until browned on all sides and cooked through. 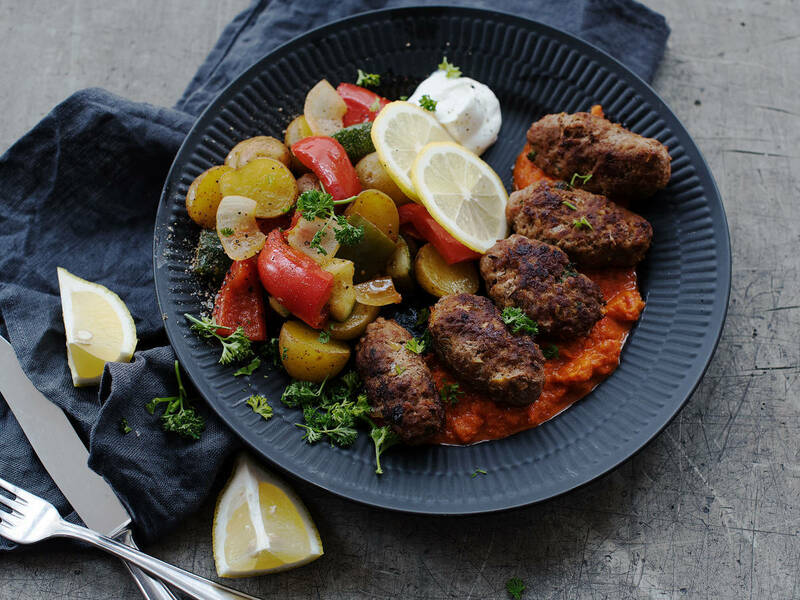 Serve with ajvar and yogurt and enjoy!